Pantones: Where Does Your Corporate Color Come From? The most, perhaps, interesting snag in printing is to achieve complete coincidence and repeatability of colors. Make it so that the corporate color, set in the brand-book looked everywhere the same – on the business cards, the folder, the corporate mug and embroidery on the pocket of the apron. It is very difficult to achieve this. The “Sunflowers” by Van Gogh brush is known not only as a beautiful masterpiece, but also as a model of imperfection of colors. 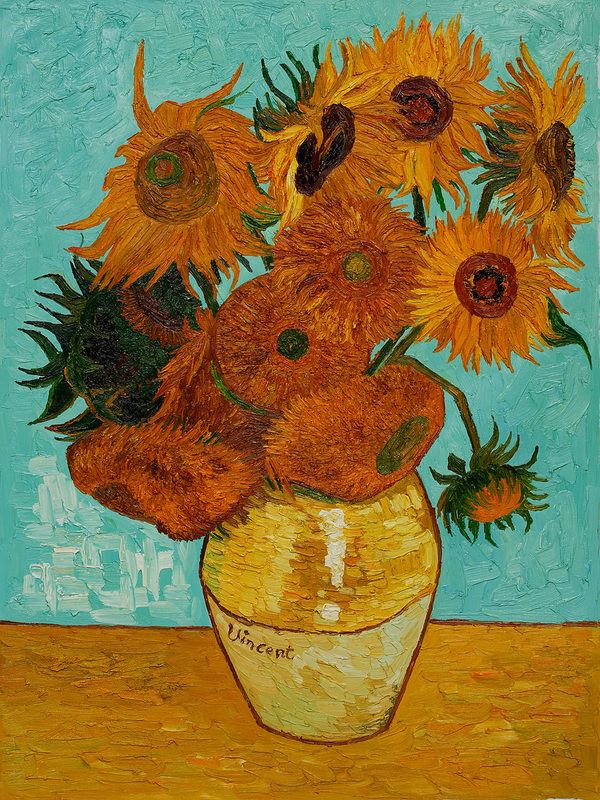 Van Gogh used a white pigment based on sulphate, which gradually began to darken under the influence of ultraviolet. This is a very slow process, but over time, sunflowers from yellow will turn brown. Very sad. Any paint has a rather complex composition. Manufacturers of printing inks stand all the necessary standards and achieve almost full compliance with the standards set. But even within these standards unexpected things can happen. For example, paints from different manufacturers can behave differently on a certain grade of paper. Sorts of paper also have slightly different chemical composition, when soaking, the paper interacts with the paint – and can change slightly. All this occurs within the limits defined by the standards, and should not bother the customer (this is more the headache of the typographer of the printing house). What we need to know about pantones? So, the pantones, or rather the PMS (Pantone Matching System) catalog, which Pantone LLC has been releasing for more than a decade. The modern company Pantone is a multifunctional service that covers all the needs for standardizing colors in many industries. It is important to know: polygraphic paints are manufactured and compiled according to Pantone standards. Fan of pantones – this is a large stack of strips of paper measuring 23.5×4.2 cm, which are printed samples of different colors. Both the paper itself and the colors on it are rigidly defined by Pantone standards. These fans are used, firstly, as standards of certain colors, and secondly – as a guide for mixing and reproducing colors. For example, the Pantone Formula Guide contains 1755 PANTONE Solid Colors. In order to indicate a specific color, it is enough to know its number “according to Pantone”. The technologist will get the fan and find the specified color. On the fan you can see the color standard and indicate how to mix it. The last color – Transparent White is used as a diluent to produce light mixed colors. All other colors on the Pantone fan are obtained by mixing the basic colors. On the fan are written their formulas – composition and proportions, in which the given base paints are mixed. Triad and pantone colors do not mix with each other. In a large set of technologists, you can find up to ten different fans. All of them are different – paper and a set of colors. Paper: the same color printed on glossy and matte paper will be vary different. Matte paper absorbs the paint more, the color on it will be softer and muted. Gloss (coated) paper adds color brightness. Red color on offset paper will differ markedly from the same red on coated paper. Printing on metallized paper will radically differ – for it has its own fan. To compare the color with the standard, you need to take the appropriate fan (matte or glossy). The basic pantone fans, which are used in everyday work, help mix pantone colors and match the colors of CMYK. Fan CMYK Process Colors is a set of combinations of triadic colors. It is formed with a step of 5-10% and “closes” the entire palette from the composite black to indistinguishably light shades. There are two such fans – on glossy and matte paper. The CMYK fan is most often used as a standard when evaluating a printed sheet for full-color printing – how much the color on the print, known by interest, corresponds to the sample. Also, you can specify the company or frequently used color in the CMYK palette – and the printers will be guided by the standard from the fan. Fan Pantone Solid Colors. They are also several, on different papers and with different base paints. The most common set is two FORMULA GUIDE Solid Coated & Solid Uncoated fans, each containing 1755 blended colors – on coated and uncoated paper. There are additional fans – on metallized paper, pastel and fluorescent colors. By these fans “mix” the mixed colors. How does this happen? For example, you specified in the brand-book: the corporate color of PANTONE 1817. The color is found in the fan and mixed from PANTONE Red 023 and PANTONE Black in a 16/6 ratio. Another important set is the two fans of Color Bridge Coated & Uncoated. They help to translate Pantone into CMYK. 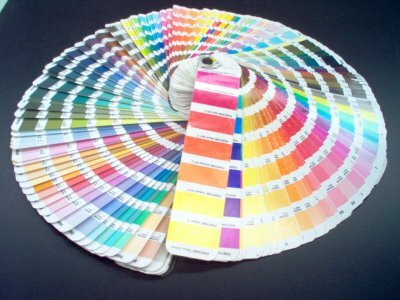 In general, the basic and mixed colors of Pantone are therefore used, that they can not be printed with triadic colors. CMYK has a small color gamut, even RGB when transferred to CMYK loses its brightness and saturation. No color from the Pantone Solid Colors palette can be accurately reproduced with the colors of the CMYK palette. But sometimes the situation forces you to use only 4-color printing with triadic colors. In this case, the choice of CMYK percentages is helped by the Color Bridge fan. But if you carefully look at it, you will see that the correspondence of colors on it is rather approximate.